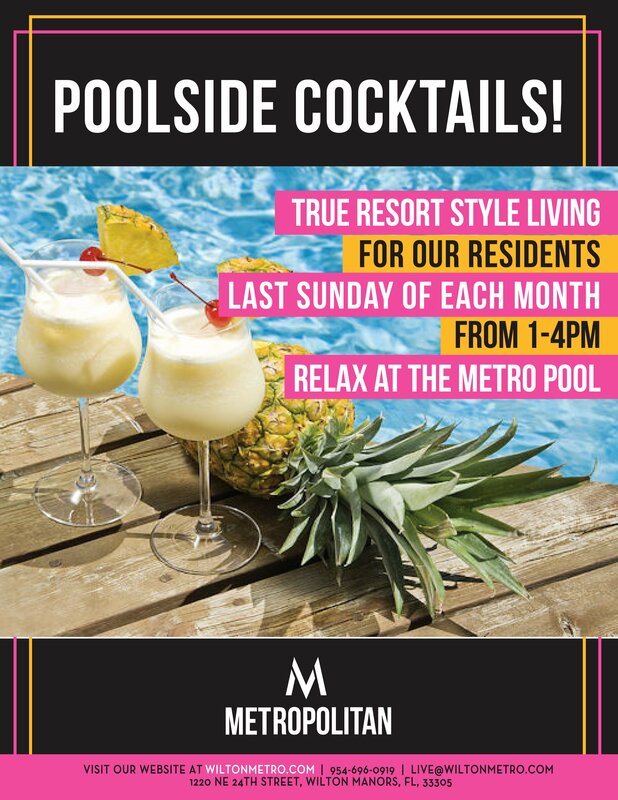 Metropolitan Apartments is thrilled to offer our residents to many incredible events to enjoy right in their backyard. 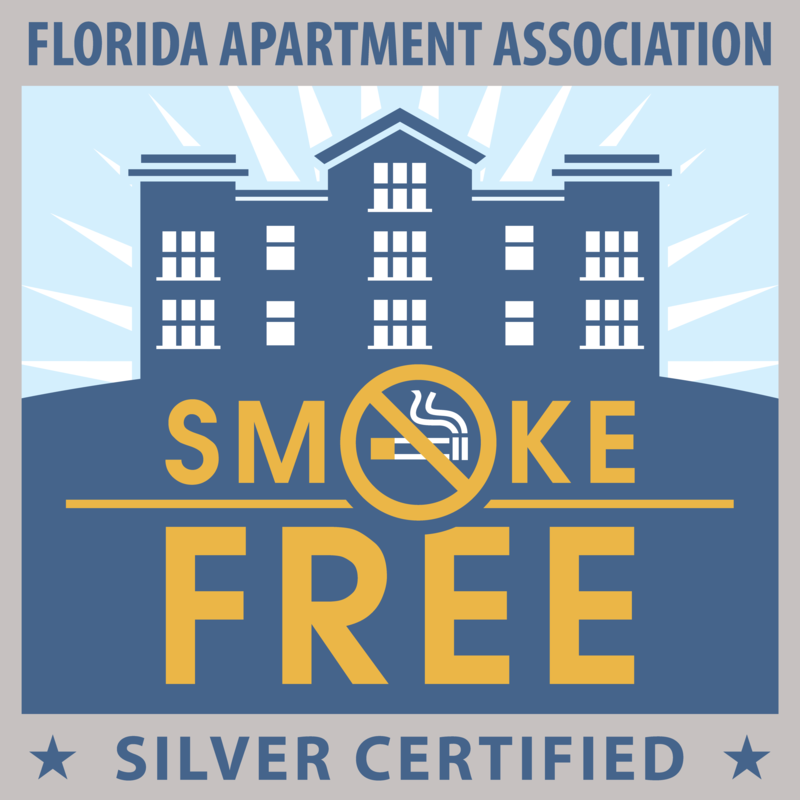 We offer events that residents can plan for and invite friends to come and enjoy as well. And several of our events are open to the public. Get fit with us! We offer fitness training classes weekly on Tuesday and Thursdays. BiltWellness conducts a group fitness program that will keep you motivated and challenged. From cardio to kickboxing, HIIT and strength training, their group fitness classes are full of energy and help you burn calories while having fun. Sign up to reserve your spot. No time for a car wash? On the first and third Sunday’s of each month from 10 a.m. to 1 p.m., Gil’s Mobile Detailing is onsite. For only $25 you receive a deluxe hand wash plus the interior. There are only ten spots available for reservation. Reserve your spot by emailing [email protected] thru our resident portal. Socialize with us at our Herb Harvest which takes place the first Friday of each month. Join us for bites and seasonal cocktails. We use fresh herbs from our community garden you will find inside our community. It’s a great way to get to know your neighbors and make new friends. Food Truck Night is another awesome way to get to know your neighbors while enjoying dinner from a local food truck. And this one is open to the public. This event takes place on the third Thursday every month. Our Art Park Market is unique. We let our residents set up and sell their own goods. The surrounding neighborhood and the public are welcome to pass by and “shop”. 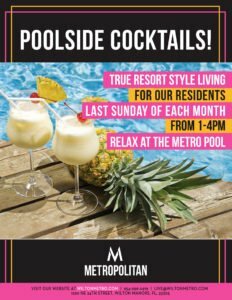 The market takes place the fourth Sunday of the month from 9 a.m. to 3 p.m.
Lastly our newest event is our Poolside Cocktails! Taking place the last Sunday of each month, residents are welcome to enjoy cocktails from 1 p.m. to 4 p.m. while enjoying our pool and cabana. Metropolitan Apartments offer studio, one, two and three bedroom apartments. The apartments are designed with the features you want, open kitchens, granite counters, island and more. We also offer the amenities that make life easy, dog park, fitness studio, electric car charging station and more. Call 844-779-6066 to speak with a leasing professional.